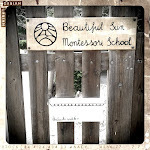 Beautiful Sun Montessori: "Free to Learn"
"Play is nature's way of ensuring that young mammals, including young humans, will practice and become good at the skills they need to develop to survive and thrive in their environments." 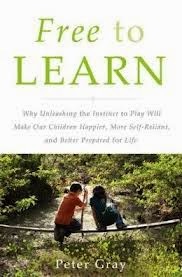 "Learning, creativity, and problem solving are facilitated by anything that promotes a playful state of mind, and they are inhibited by evaluation, expectation of rewards, or anythign else that destroys a playful state of mind." "Imagine that you had omnipotent powers and were faced with the problem of how to get young humans and other young mammals to practice the skills they must develop to survive and thrive in their local conditions of life. How might you solve that problem? It is hard to imagine a more effective solution than that of building into their brains a mechanism that makes them want to practice those very skills and that rewards such practice with the experience of joy. That, indeed is the mechanism that natural selection has built, and we refer to the resultant behavior as play. Perhaps play would be more respected if we called it something like "self motivated practice of life skills" but that would remove the lightheartedness from it and thereby reduce its effectiveness. So, we are stuck with the paradox. We must accept play's triviality in order to realize its profundity. " "Playing with other children, away from adults, is how children learn to make their own decisions, control their emotions and impulses, see from others' perspectives, negotiate differences with others, and make friends. In short, play is how children learn to take control of their lives." "In play, whether it is the idyllic play we most like to envision or the play described by Eisen [violent play] children bring the realities of their world into a fictional context, where it is safe to confront them, to experience them, and to practice ways of dealing with them. Some people fear that violent play creates violent adults, but in reality the opposite is true. Violence in the adult world leads children, quite properly to play at violence. How else can they prepare themselves emotionally, intellectually, and physically for reality? It is wrong to think that somehow we can reform the world for the future by controlling children's play and controlling what they learn. If we want to reform the world, we have to reform the world; children will follow suit. The children must and will prepare themselves for the real world to which they must adapt to survive." "Children must feel safe and cared for in order to devote themselves fully to exploring and learning, and children learn best from those with whom they have caring, trusting relationships." "I doubt there has ever been a human culture, anywhere, at any time, that underestimates children's abilities more than we North Americans do today. Our underestimation becomes a self-fulfilling prophecy, because by depriving children of freedom, we deprive them of the opportunities they need to learn how to take control of their own behavior and emotions."